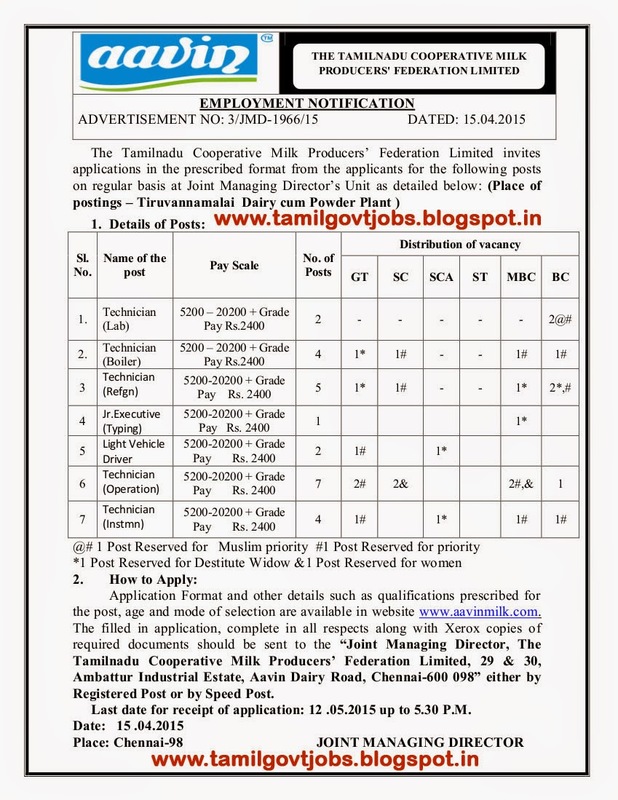 Applications are invited for Technician (Lab), Technician (Boiler), Technician (Plumber), Technician (Refrigeration) and Technician (Operation), Jr Executive and Driver Posts in Tamilnadu Co-operative Milk Producers' Federation Ltd Chennai through direct recruitment process. Technician (Lab) - 2 Posts (BC) - Basic Pay 5200 Grade Pay 2400 in Pay Band I category - 10th Std Pass with Diploma in Laboratory Technician. Technician (Boiler) - 4 Posts - Basic Pay 5200 Grade Pay 2400 in Pay Band I category - 8th Std Pass and Grade II or Grade III Boiler Attendant Certificate from Directorate of Boilers Chennai. Technician (Operation) - 7 Posts (1 BC ; 1 BC Muslim ; 1 ST) - Basic Pay 5200 Grade Pay 2400 in Pay Band I category - 10th Std Pass and ITI Trade Certificate in A/c Mechanic / Fitter / Mechanic / Electrician / Wireman / Instrumentation. Technician (Instrumentation) - 4 Posts - Basic Pay 5200 Grade Pay 2400 in Pay Band I category - 10th Std Pass and ITI Trade Certificate in Instrumentation. Junior Executive (Typing) - 1 Post - Basic Pay 5200 Grade Pay 2400 in Pay Band I category - any Bachelor's Degree with Typewriting Senior Grade in English and Tamil. Light Vehicle Motor Driver - 2 Posts - Basic Pay 5200 Grade Pay 2400 in Pay Band I category - 8th Std Pass and should have a valid driving licence with 3 years experience .